Because the big 'S' word comes up so often in homeschooling discussions, I thought I would share links to a few articles and posts I have found recently. Three of my links send you over to Principled Discovery where Dana has some pointed things to say on the subject. Check out How Education Became Indoctrination, On Socialization, and So, how do I plan to socialize my children? Here are a few funny (and a few not so funny) socialization responses over at A to Z Home's Cool. Greg Sherman, Ph.D. gives Ten Good Reasons to Homeschool. It is an excellent article and sums up my reasons for homeschooling quite well. Check out Reason #6. Homeschooling and the Myth of Socialization by Manfred B. Zysk is another interesting article if your eyes haven't yet glossed over. I recently finished reading Babe: The Gallant Pig to Levi. (I have to admit here that Russ read a few of the chapters...) I know I rave about so many of the books we read, but this story is another one for the wonderful list. Babe is a lovely example of the rewards of being polite and kind. I love the simplicity. I love Mr. and Mrs. Hogget: he, the silent type--she, the boisterous, rambling, head-nodding, red-cheeked, farmer's wife. They seem so genuine. We often watch the movie version of books once we have read them. I remember watching Babe years ago and loving it. The movie ended up in my cart at Amazon (wonder how that happened). Levi loved it! Babe is a perfect family movie. Add it to your collection! Need ingredients for an apple pie, but the market is closed? You'll need to pack a suitcase and catch a steamship bound for Europe! How to Make an Apple Pie and See the World is a picture book full of vivid, whimsical watercolor illustrations. Gather wheat in Italy, cinnamon in Sri Lanka, and sugar cane in Jamaica! When you have finished reading this story, your mouth will be watering for hot apple pie. Luckily our neighbors have an apple orchard, although Vermont would have been lovely! Because I had a five-year-old and a three-year-old helping (and a one-year-old under foot), we experimented with an easy press-in crust rather than rolling out a traditional pie crust. The boys loved getting their hands messy (and the counter, and the floor....). I had the privilege of taking photos of my sister's children. They are absolutely adorable, handsome, and gorgeous! days so as not to overwhelm you. I can't believe I finished all 814 pages with more than a week to spare before my book club meeting! I started The Silver Chalice while on vacation, reading aloud to Russ while driving, but didn't manage to get very far (children needed attention, and all). When we arrived home, Russ snatched it away and finished it as I labored under a mountain of laundry. Finally, he gave the book his stamp of approval and handed it over. A couple years ago, my book club decided on a choice of four books for a particular month. I chose to read The Robe and hoped to read the remaining books (The Silver Chalice, Ben Hur, and Quo Vadis) in the future. When planning out the book list this year, a member suggested we choose again from those four books one month. I was thrilled! The Robe was excellent, surprising me as I had not read anything set in that time period other than The Bible. 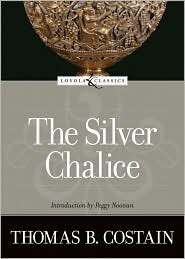 The Silver Chalice was highly recommended, and I hoped not to be disappointed. Disappointed I was not. The writing style was clear; the characters came to life; the plot moved along; there was romance, mystery, adventure, history, and believable transformation in the life of the main character. At no point did I feel bogged down. I just wished for a whole day without interruptions so that I could bury myself in the story. The Silver Chalice follows the life of Basil, a Roman citizen and artisan, as he is adopted by a wealthy merchant, has his position stolen from him by a dishonest uncle, is sold into slavery, and then has his freedom purchased so that he can design a silver chalice to hold the sacred cup used by Jesus at the last supper. Basil travels from Antioch to Jerusalem, Greece, and Rome to fulfill his commission. Having very little knowledge of ancient history other than the Bible, I felt the author did an excellent job of making the story accessible and informative. I loved the picture he gave of famous men of the Bible such as Peter, Joseph of Arimathea, Paul, and especially Luke. It made me so very happy to have a little boy with the name Luke. Levi and I have been reading through the New Testament in his Children's Illustrated Bible, and I have had a few aha! moments as I relate the two stories, even though The Silver Chalice is a fictional account. I have had an easier time seeing the larger picture. Levi wanted to know if he could attend book club since he 'knows all about' Ben Hur. He has listened to the radio theater version of Ben Hur, and watched an animated version with the voice of Charlton Heston. I guess it is time to create a book club which he can attend! And I suppose maybe I'll have to catch up and listen to/watch those versions before my book club meeting! My excitement to study ancient history this next year has increased. Ben Hur and Quo Vadis will be on my reading list for 2008. It is quite possible that they will both join The Robe and The Silver Chalice on my favorites list. The Western Wall, also known as the Wailing Wall, is a Jewish holy place found in Jerusalem, Israel. It is part of the first and second temples that were mostly destroyed. I chose this location to add to our 'Around the World' cards this week. 6. Hugo, Victor. Les Miserables. I remember exactly why I first read this book years ago. My mom gushed and raved (and she isn't a gusher), and then promptly told me that she didn't think I could get through it. I attacked it with gusto. Isn't she a smart mom? I want my boys to read this book so that they can see one more shining example of a real man's actions. Heroic. Steadfast. Honest. Jean Valjean is *the man* (in the literary world) in my humble opinion. Don't miss the Broadway musical. Absolutely stellar. Just the other day I slipped in the CD soundtrack, and it still brings an amazing array of emotions to the surface. My boys thought I had gone off the deep end as I sang at the top of my lungs. 24601. 7. Lee, Harper. To Kill a Mockingbird. I don't know what to say about this book that hasn't been said already. The movie is excellent but no substitute for the original. 9. Otis Skinner, Cornelia and Kimbrough, Emily. Our Hearts Were Young And Gay: An Unforgettable Comic Chronicle of Innocents Abroad in the 1920s. I decided to provide a little variety in my top ten, and this book represents humor in its best form. It probably doesn't even qualify as fiction (it chronicles the 'real' adventures of two young ladies traveling abroad), but I'm claiming amnesia, or naivety, or ignorance, or.... something. Read this book if you want to shake with laughter. Then go read Down the Garden Path by Beverly Nichols and A Year in Provence by Peter Mayle. 10. Milne, A. A. Winnie-the-Pooh. The mark of a brilliant 'children's' author is the ability to appeal to children and adults alike. Winnie-the-Pooh is one of Levi's favorite books. Oh, but the humor, the subtlety, the timelessness.... So much is lost on the young ones! Go back and read it, or read it for the first time. Don't overlook this one because you think it is childish, or because you've heard the 'Disneyfied' version. The audio version, read by Peter Dennis, is excellent. When you're done with Winnie-the-Pooh, be sure to move on to The House at Pooh Corner! Here is a link to my first five. I'm still waiting for you to list one or more books in your top ten.... take this opportunity to de-lurk and chime in!